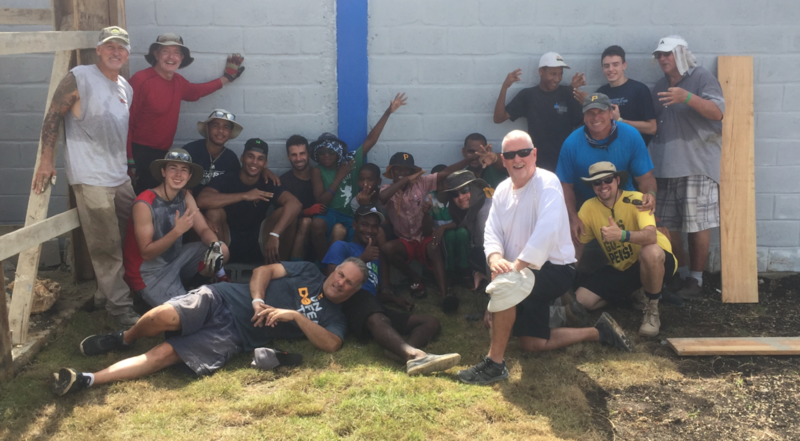 Put 12 men together for 7 days joining the Holy Spirit in his work in the Dominican coastal town of Boca Chica and what do you get? Life change! We spent one hot and blessed week assisting a growing ministry called Holt’s House of Hope (HHH) that reaches out to neglected and homeless boys. HHH Director Chris Tanton and his wife Abbey were our gracious hosts; their love, leadership and spiritual impact upon the young men under their direction was powerfully evident throughout the week. They are equipping young leaders like Miguel, Erikson and Winston. Chris had an outdoor shower, several gardening beds and painting for us to work on throughout the week but working and worshipping with the boys was the highlight (see the video below). Denny Hyland led the basketball outreach each day with an FCA team in the evenings with our young bucks. Here is a reflection on our week from one of our men, Jim Thrasher, who joined us with his son Isaac. Isaac and I would like to share with you that we are thankful to the Lord on how He used the whole experience…to impact our lives last week. It is hard for us to describe all the ways the Lord worked in our hearts in the DR. It was a life altering—convicting—humbling—introspective—JOYOUS experience. More importantly, we are praying for the seeds the Lord planted through all of us in the lives of the boys—that they would know true Love, Christ’s Love…Thank you for investing in Isaac and me. We were blessed to be a part of a very diverse (Polka-Polka-Polka ) but cohesive team. The Lord was at work! Your teaching on Samson was very instructive…Thank you to you and Denny for setting in place “an environment of encouraged vulnerability” in our study that opened some of our locked up hearts. We would deem it a privilege and a great opportunity to be a part of the returning team next summer.